Most definitions of “blended learning” converge on a combination of face to face (F2F) learning activities and computer-mediated ones. Many learning institutions and corporations offer some type of blended learning, and it is almost impossible to imagine a very near future where some haven’t explored, if not fully implemented it. If some studies (Bonk, Kim & Zeng, 2005) placed the number of higher education instutions using blended at 93% back then, it’s quite likely we are at 100% now. A sharp focus on technology when categorizing learning leads to separate entries for “Online Learning” and “Mobile Learning”, entries that are equally sized components of a blended learning chart. Anyone having trouble with the huge overlap between “Online” and “Mobile”? What about other non-classroom, offline, computer-mediated learning? What about the use of mobiles for online access while in the classroom? Sadly, “blended” only says the learning experience will combine computer/device-mediated learning with supposedly non-tech classroom. That, if you ask me, is limiting and a poor descriptor of what the learning experience will be. Recently I was involved in the design of a learning solution where blending was not imposed as a requirement – it simply felt like the right combination to achieve the learning goal. We could have gone F2F-only as expected, but ended up designing a blended solution that received 100% learner satisfaction. What was the process? We didn’t focus on the “ingredients”. Nobody suggested “oh, we must do this online”, or “we could use a mobile app here”. Instead, we looked at the learners’ context, ways to optimize limited F2F time and best approach to create and retain reusable learning artifacts. The fact that the implementation of these requirements resulted in something that the industry calls “blended” is immaterial – we weren’t even looking at the implementation ingredients. In fact, learners don’t care either. Many studies (JISC is a good source) confirm learners are comfortable adding new technologies to their learning mix. They will happily use technologies, and in some cases appropriate them to complement any learning solution that doesn’t fully satisfy their learning needs. 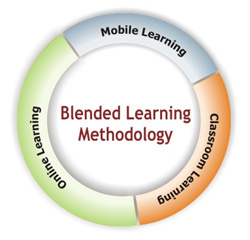 In this context then, isn’t “blended” a term created by learning organizations that reveals their immaturity in adopting technology to create effective learning solutions?